​You will have noticed that I have been very quiet for many months. That is because there has been nothing to report as Stratford District Council (SDC) have missed deadline after deadline in producing the promised PBA Socio Economic report that they commissioned over a year ago. I am making up for that silence with a slightly long e-mail for which I apologise, but I think this is important. If you do not have time to read this whole e-mail (we are all busy, I know that), please at least go straight to the bottom to the section titled HOW CAN YOU HELP? and read that piece. That report has now been published and it is to be discussed at SDC Cabinet on 11th February 2019 to determine the next steps. The report has been accompanied by a 99 page high level Environmental Report that we have only had access to since this Friday afternoon, so needless to say have not yet been able to read properly. 3.1 To note the study from PBA and take no further action. 3.2 To commission further work to progress the project in full. Clearly 3.1 would be our preferred decision, but indications are that 3.3 is more likely to be adopted. Whilst this would not give the green light to navigation at this stage, it is clear that it is a first step in an incremental plan that could make navigation more likely in the future. For that reason we need to try to get option 3.1 passed. 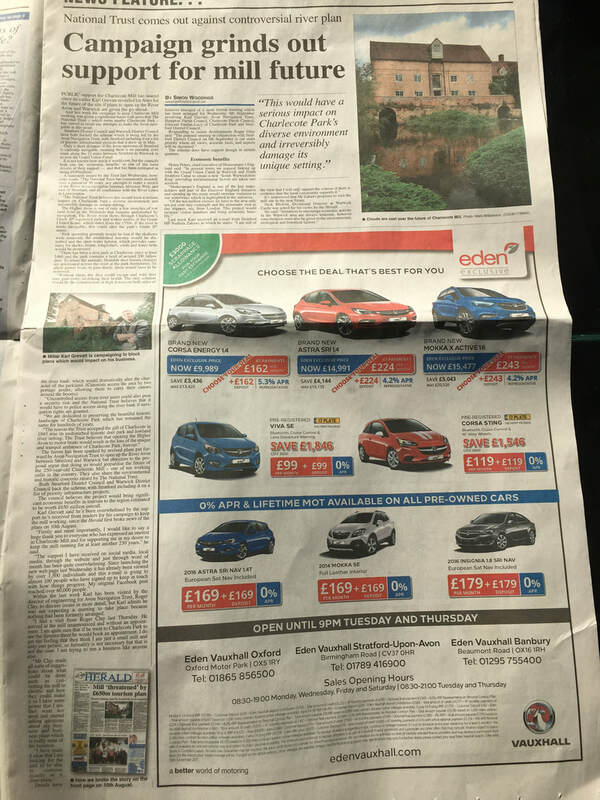 Firstly, the good news is that we have unequivocal support from both Warwick Castle and The National Trust and they have been quietly supporting our cause through their desire not to see any impact on their respective properties. Also in support are many other organisations and individuals who have equally opposed this from the outset. At a meeting today it has been agreed that we will join forces to give a unified message of opposition to the Cabinet Meeting. Stratford District Council have to take note of all views submitted to them in relation to any matter. I have 903 people on this list now and if every one of you could write to the Council with your objection, that would have to be taken into consideration. Even better, if you can get all of your friends or family to write too, that would be amazing. You can write either in the traditional way or by e-mail, either one is acceptable and must be noted. I have added below the address and e-mail addresses you should write to. I would urge you to be factual and non emotional. Councillors are not known for being swayed by emotion, but they have to deal with facts. Again, for anyone who does not have time, I have added below a few words that you may use as a basis. Thank you so much for reading and thank you for your continued support for the Mill. Now is the time to let your views be known and a letter or e-mail NOW will help our cause greatly. A few words that you may be able to use (feel free to edit, amend or add to these in any way you wish, it is just an idea). I write with reference to the Avon Navigation Scheme that is to be discussed at Cabinet on 11th February 2019. I wish to strongly oppose this proposal on the grounds that its approval would significantly and irrevocably damage a large area of un-spoiled natural waterway for what appears to be very little gain. I have a particular interest in protecting Charlecote Mill which is one of the most important mills in the country. Charlecote is recognised not only for its original, unusual and well conserved fabric but more notably for being one of a small handfull of mills to still run commercially using only natural power. This very unique business is something that in an area known for its heritage and tourism should be preserved and cherished in its current state. In fact, with a large local customer base and its support of local farms for its wheat, it is an important economic as well as heritage asset in the District. Any suggestion that it can be protected within this scheme, without any detailed, agreed and workable technical designs is simply irresponsible. I further object to this scheme for the damage that it would do to an environmentally diverse area that has remained untouched for hundreds of years. The risk of damage to a rich wildlife habitat and the likely impacts to flood and water level increases are not acceptable in an age where conservation is so highly prized, not to mention the potential financial and human cost of more frequent flooding were that to happen. For the report to almost brush over the impacts to such an important local asset as Charlecote Park and Warwick Castle just reinforces that view. I believe this proposal to be ill thought through and to not represent the views of the large majority of those living along this route. As such I believe the only sensible conclusion is for you to vote to not pursue this venture further in any form, either now or in the future. The Avon Navigation Trust (ANT) proposal to allow river navigation between Stratford and Warwick is now a real possibility and has the support of Stratford District Council. Please help us to oppose this damaging plan. Since the 1970's a proposal has existed to make the 12 mile stretch of the River Avon between Stratford Upon Avon and Warwick navigable to pleasure boats. Apart from the outstanding natural beauty of this unspoiled stretch of River and all of the inherent wildlife that exists, the scheme would bring boats to the immediate vicinity of Grade I listed Warwick Castle & Charlecote Park and Grade II* listed Charlecote Mill. The necessary increases in water level to achieve this scheme is likely to render Charlecote Mill inoperable and after over 250 years of milling using natural power the mill would become redundant. This proposal is now listed as a key infrastructure project for Stratford District Council and this makes it all the more likely to go ahead if opposition to the plan is not emphasised. Just by viewing this page you are already helping us by showing your interest. What we really need though is awareness, so please help us by sharing and publicising this web page (http://www.charlecotemill.co.uk/protect-charlecote-mill.html) and our facebook page (https://en-gb.facebook.com/charlecotemillspage/) with as many of your friends and contacts as you can. ​Subscribe below to be kept informed about how we are getting on. If we need to, we may launch a petition after our meeting with the District Council and Upper Avon Navigation Trust and we will be very grateful for your support if and when that time comes. Finally, if you feel so inclined, you may write to the Council, Navigation Trust or other interested parties stating your objections. Don't feel you have to, but if you do write it will always be helpful if you can copy us at charlecotemill@live.co.uk Contact details for Councillors etc can be found on the next tab. Charlecote Mill operates with two undershot waterwheels, each of which is some 18 feet in diameter. As shown above (this is not Charlecote's wheel), an undershot wheel requires a "head" of water at the rear of the mill that is controlled by a sluice gate or control gate to allow it to flow onto the close fitting paddles of the water wheel. Crucially, there is then a fall of about 2 feet before the water flows away into the Tail Race at the front of the mill. The water level in the Head Race at the rear is rarely a problem, although sometimes a bit more would be nice in the high summer season. The important aspect is the ability of the water to flow away into the Tail race to maintain that fall. If the water level is increased in the tail race (making it the same or similar height as the Head Race) you can imagine from the image above that as the wheel rotates, the paddles from bottom centre to the front of the wheel are trying to lift the water and that uses the power that has been created at the back of the wheel. This is known as back watering and will prevent the mill from running. The water in the Tail Race flows away to the River Avon from where it originally came. If the water level in the river was to be increased, as we believe is necessary to allow boats to navigate, the water will no longer be able to flow away sufficiently and the Tail Race level will rise, thus preventing the operation of the mill. Why is Charlecote Mill so special? There are less than 50 working wind and watermills left in the UK. Who is driving this proposal? Please bear with us whilst we finish building this page, we are trying to complete it as quickly as we can, in between making our lovely flour! Why do these ORGANISATIONS want this proposal to go ahead? Is Charlecote mill a tourist attraction? No, Charlecote Mill is primarily a historic working business, this is what makes it so rare and unusual. Yes, it does open to the public 12 - 14 days each year and on those days it is very popular, but that is not the main reason for this mill being protected. Can i see the mill for myself? Is this just about charlecote mill? No, not at all. 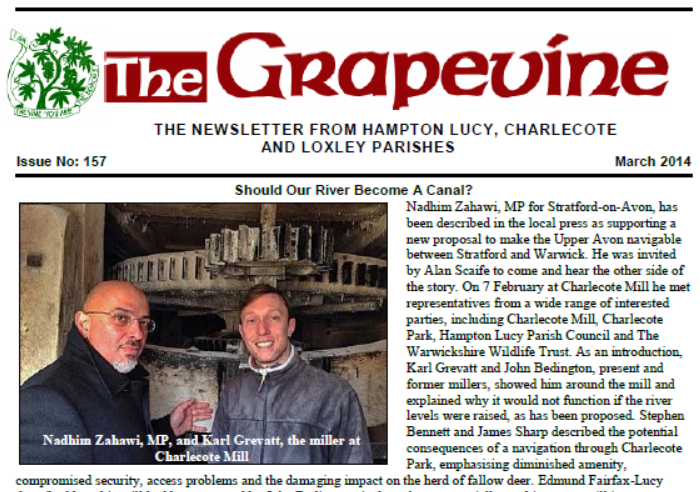 Of course the mill is our primary concern, but this scheme affects a 12 mile unspoiled stretch of the River Avon that passes through Charlecote Park with its rare Deer herd, Warwick Castle and its scheduled monument bridge and many pretty English villages. This stretch of river is a wildlife haven and home to many rare and unusual species, including otters, kingfishers, moths and butterflies. The whole river stretch deserves to be protected. Will this scheme cause more flooding in the local area? We can't answer this question definitively, we are sure that someone somewhere will have considered that, but logic would surely make you think it must be a risk? After 30 years or more of insisting that this scheme will allow Charlecote Mill to continue running, ANT are now only "more confident". That does not sound like a resounding guarantee of future protection for the mill in its current form? Can they be trusted? 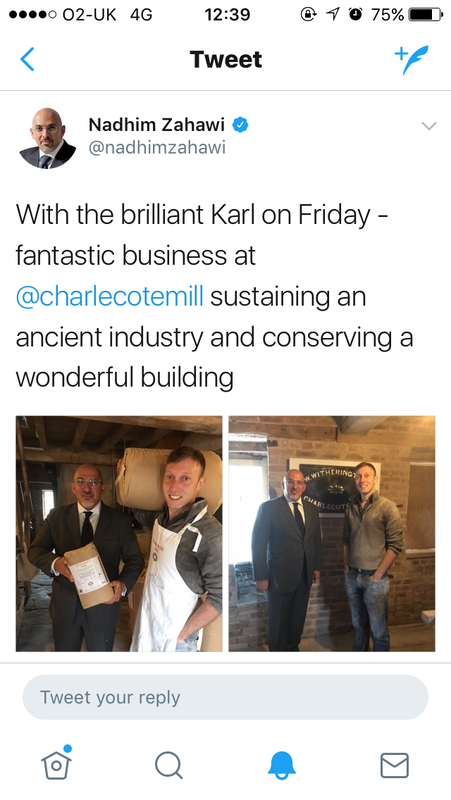 In 2014 Charlecote Mill welcomed Stratford Upon Avon MP Nadhim Zahawi to hear our views as well as those of the National Trust, Parish Councils and local wildlife experts. The full PDF article can be downloaded below. In recent correspondence, Nadhim stated "I am still of the view that I will only support the scheme if there is evidence that the local community supports it". We look forward to welcoming Nadhim back to Charlecote Mill in the near future. We have received a huge amount of interest from the media, both local and national. Where available, you can click on the images above to go to the full articles. We have received so much support and goodwill from so many organisations and individuals, from all across the world. The list above represents some of the larger organisations that have shown their support, but we are really grateful to everyone who has shown how much they care about the Mill. Please continue to help us to protect this amazing piece of living working history and wonderful stretch of the River Avon for many generations to come. "I am still of the view that I will only support the scheme if there is evidence that the local community supports it"
To check the legal status of the "Halcrow Report" and determine if he can release this publicly (HLPC and others have requested this many times from ANT but have yet to get official sight of the document). To better understand the detail and content of the 2004 public enquiry and to understand why he has not been made aware of this previously. To check the status of "Upper Avon" against "Higher Avon". This is a key point as the Higher Avon (the stretch beyond Alveston Weir) may not be within the remit of ANT. To look at the remit that ANT have over the lands along the reaches of the Higher Avon. To get an understanding of the availability of land. To begin to understand the potential cost benefit of the scheme. To understand who is spending what in relation to the study. To investigate a previous navigation bill and understand the reasons for it not being presented to Parliament. To better describe the timescales for progression of this study. Further questions were asked with regards to the charitable status of ANT and whether their pursuance of this scheme may fall outside the remits of their charity purpose. We will keep a close eye on that particular point, but needless to say, if they are outside their remit the Charities Commission are likely to take a poor view. Peter re-emphasised a point that for him, compulsory purchase of land is not an option for SDC in relation to a "vanity project". The next stage is for SDC to carry out Social, Economic and Environmental studies. There is no set timeframe for this, and SDC will continue to pay the fees for ATI Projects in relation to this during this time. Let's hope that this happens quickly so that we can all carry on our lives without the worry and uncertainty that now exists. We had our meeting today with Cllr Peter Richards of Stratford District Council and The Avon Navigation Trust. The meeting went surprisingly well and it quickly became clear that Peter has been poorly advised and misinformed to this point. He listened very carefully and without bias and was very surprised by some of the revelations, not least the claim that this scheme would bring £650m of revenue to the area. He has firmly denied that this number can be substantiated and is insistent that it will not be used in future. He was also shocked by our revelation that the scheme is for boats with a beam of up to 12 feet, something he was not aware of. ANT by contrast were as belligerent as we would expect them to be, but Cllr Richards was very good at keeping them on a listening brief and ensuring it was our voice that was heard. ANT insist that any past scheme proposals are no longer valid and that they are starting this with a "blank sheet of paper", but we still find it hard to believe that they will not just come back with the same proposals. After all, the route of the river and all of the obstructions along its way have not changed in the past 30 years or more (arguably in the past couple of hundred years). Listening still does not seem to be their strong point, but we are getting very good at pushing the message in their faces. We were very well supported today by Hampton Lucy Parish Council, The owner of the mill and my Landlord Edmund Fairfax Lucy and The National Trust as well as a small number of volunteers. The voice was unanimous and very hard for Cllr Richards not to hear. I am confident that he is starting to very clearly recognise the importance of the mill and its surrounding areas. In conclusion, Peter Richards stated that the scheme is in an early stage with SDC and whilst it is listed as a key project does not yet have the full backing of the Council. 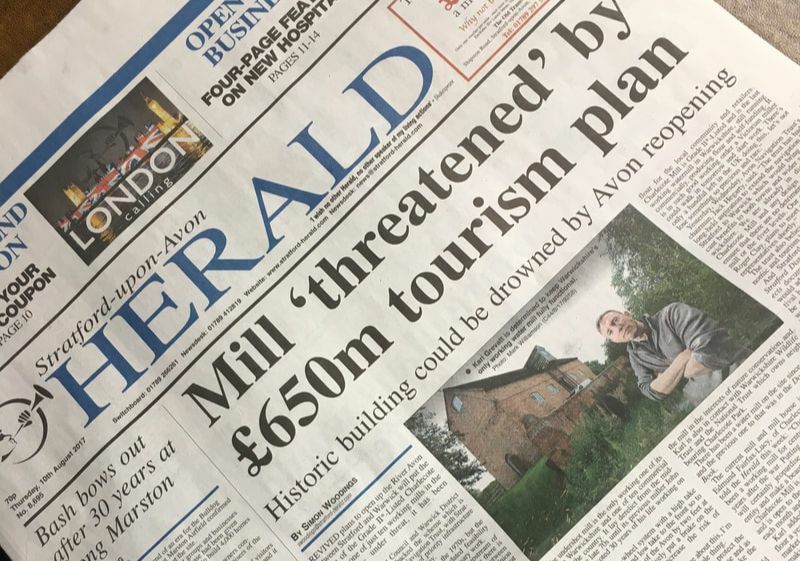 Without assurances and evidence that the Mill can continue to operate in its current form from ANT and any other studies that take place, he would not support the proposal further. It has led me to wonder how on earth ANT have managed to get this far and have it listed as a Key project, but I guess that is a subject for another day. So, all in all, a good day. The fight is far from over and we must not be complacent, indeed, we should expect the worst, but this is a small step forward after so much bad news. Please keep supporting and sharing, hopefully we can make this a non starter quickly and perhaps save a lot of taxpayers money (your money) being wasted in proving the scheme is not viable. The Director of Engineering for ANT, Roger Clay, arrived at the mill today unannounced and without an appointment. I am not sure why he thinks it is acceptable to just turn up and start asking me questions, I am quite sure that if he went to Charlecote Park to see the Director there he would book an appointment? I do get the feeling that they think I am just a small mill and only one person, so formality is not necessary, but that is not the case, I am trying to run a business like anyone else. Mr Clay made all sorts of suggestions about what could be done, such as converting the mill to electric, how they could make it so I have more power (that I neither want nor need) and started asking questions about my business and business plans, which really is none of his business. I have made it clear that I am looking for the mill to be able to continue exactly as it does today, which is the reason I know you all love Charlecote Mill and what makes it so special.